We understand that dental care needs to be affordable, especially for families. We also know that many companies have cut back on dental benefits or even cut them out entirely. Even if you have dental insurance, you may be concerned about your out-of-pocket expenses, so we make every effort to lighten your financial burden. Our House Dental Plan is an alternative for families, individuals or businesses that want excellent dental coverage without the barriers of traditional insurance. The program is designed for patients without dental insurance, as well as insured patients who may be looking for a better option. 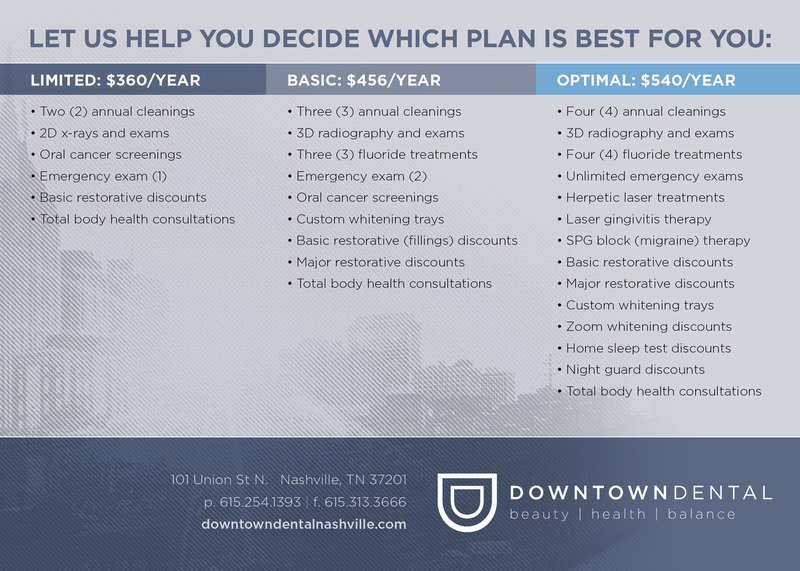 Downtown Dental’s house plan gets you savings similar to what people with insurance get without the limitations. Our house plan encourages more preventative treatment so that you can avoid expensive, time consuming, painful restorative treatment later on. Because our plan doesn’t have annual limits, you won’t be pressured to risk your health by waiting for the next year to roll around so that you have money in your account again. No more cutting corners on your wellness: Downtown Dental’s In-House Plan is one way to make dental care affordable for the whole family. Next time you’re in the office, let a DD staff member know you’d like to join. Call our office at (615) 254-1393 to have our administrative staff assist you over the phone.